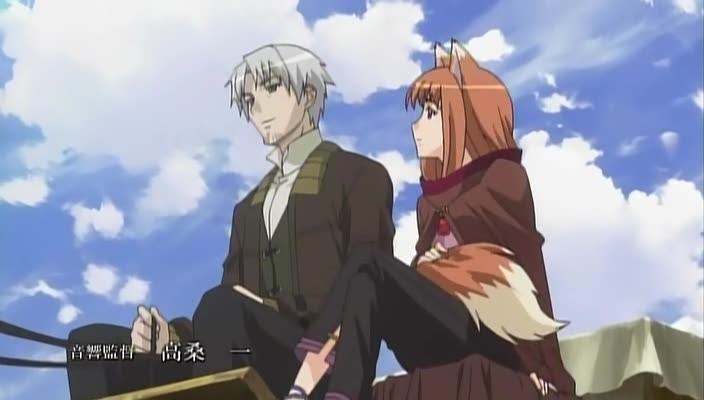 Home→Geekery→Anime→Spice and Wolf (2008) – an unusual fantasy anime. Spice and Wolf (2008) – an unusual fantasy anime. For a decidedly different anime series, try Spice and Wolf. It’s set in a medievalesque world, but it lacks the staples of magic swords, elves, orcs, or bratty princesses. Instead, it’s the story of Kraft Lawrence, a merchant who’s working as a traveling trader to gain funds, experience, and contacts to eventually open his own shop. One evening he meets Holo, an ancient wolf goddess from the North. Generations ago, Holo made a deal with the local town, guaranteeing them good harvests in exchange for honoring her. Over the centuries, the people have begun to take those harvests for granted, and have transferred their devotion to the (Christian-ish) Church. Her main festival has devolved into a harvest celebration, with her as a minor symbol. She’s feeling under-appreciated and bored, and decides to return to her home in the North. She makes a deal with Lawrence to travel with him and learn more about how the world has changed, in exchange for her help. It’s an appealing series, with excellent character development. Economics also provides some plot points, going beyond simplistic ‘buy low-sell high’. If you haven’t seen it, give it a try- (there are 2 seasons). If you have, what did you think of it?